The labor required to install and maintain a ring garden is largely spent in the installation. Installation includes the driving of the fence posts and construction of the wire ring, which acts as the trellis. Horseshoe shaped raised beds are then begun by the addition of soil, approximately one cubic yard. The finished bed is 21 feet around, three feet wide, and six inches deep. 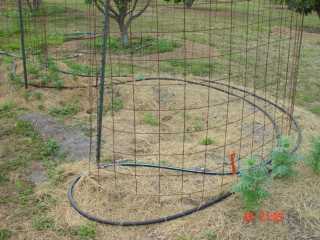 Next, drip irrigation is installed on the inside of the ring tracing the trellis around. One end is fitted with a garden hose connection. Now, planting can begin. Tomatoes should be planted next to the trellis, and thrive on the companionship of marigolds, mustard greens, herbs, and lettuce plants. Plants can then be mulched to help prevent weeds and maintain soil moisture. 3/4 inch poly tube, laid out to water both sides of the trellis. the poly easily adapts from drip to spray depending on needs. 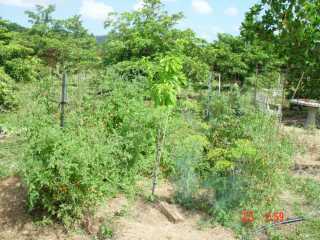 In 70-100 days, tomato plants will begin to bear fruit. Herbs and lettuce plants will be earlier, most of which are cut and come again varieties. Harvesting can and should be continuous throughout the season. Planting can begin as early as September and as late as December/January. A garden will be productive for five to six months, barring any serious disease or pest problems. An eight-foot (in diameter) ring, which includes approximately 10 tomato plants, yields about 100 pounds of tomatoes. Companion lettuce and herb plants, many of which are cut and come again varieties, would easily provide greens throughout the season.